Former Grand Slam champion and BBC presenter Sue Barker says Williams "has a point" in her criticism of the umpire. "I've sat courtside watching the men ranting at umpires and they haven't been given a violation," said Barker. 12-time Grand Slam champion and all-round tennis legend Billie Jean King has backed Williams. She said: "When a woman is emotional, she's 'hysterical' and she's penalised for it. When a man does the same, he's 'outspoken' and there are no repercussions. 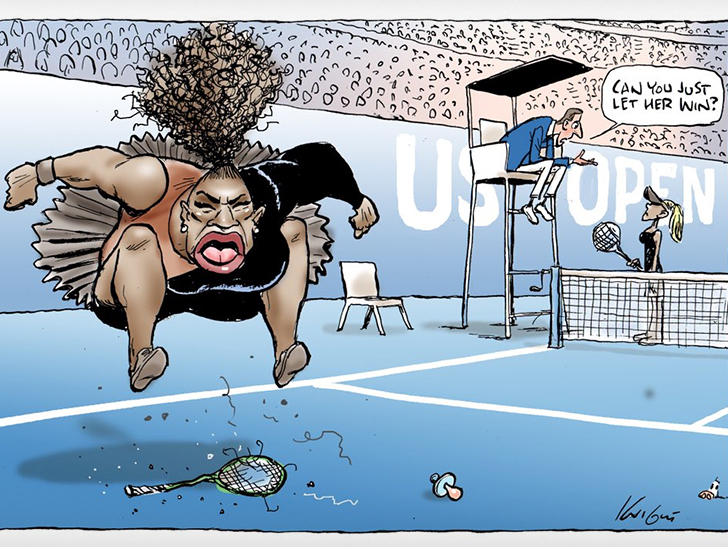 "Thank you, Serena Williams, for calling out this double standard. More voices are needed to do the same." I thought Serena overstepped the mark and threw shade on Osaka, tbh. And detracted from the fact she was thrashed. . . I thought her behaviour was totally unacceptable. She is one píssy loser eh? No, it's all to do with sexism, apparently, h. Not because she's a cùnt or anything. I can only assume she's keeping the racism card up her sleeve for if this really goes bad for her.